This was a plain frame I had picked up at the Target $ spot some time ago, I have quite a few in my stash, and they make for quick gifts. To create this frame, I repeatedly stamped the flower from With Gratitude using Pumpkin Patch Ink, completely covering the frame. Then I inked up my Canvas BG with Creamy Caramel and stamped over the leaves. Using a sponge dauber and Creamy Caramel ink, sponge all sides of the frame. Reink your leaf stamp with Pumpkin Patch, stamp on Creamy Caramel, Pumpkin Patch and Old Olive card stocks, cut out, crumple and snail to your frame. Here's the matching card to go with the frame. 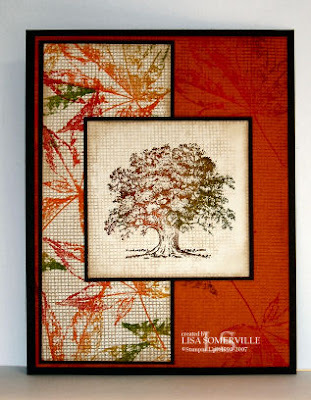 I used the oak tree from Lovely as a Tree as my focal image. Ink the leaf with the Pumpkin Patch ink, randomly stamp onto Pumpkin card stock. Ink Canvas BG with Creamy Caramel, stamp over leaves. Edge card stock with Creamy Caramel ink and a sponge dauber. Layer onto Chocolate Chip base card. Randomly stamp leaves in Pumpkin Patch on Very Vanilla card stock. Stamp Canvas BG in Creamy Caramel, edge with a sponge dauber and Creamy Caramel Ink. Layer onto Chocolate Chip, then base card. Using the Pumpkin Patch ink, ink up the top portion of the tree, use a Creamy Caramel marker to ink the trunk. Stamp onto Very Vanilla card stock. Use a sponge dauber and Creamy Caramel ink to add color to the edges of the card stock. Layer onto Chocolate Chip piece, then to base card. What beautiful fall projects! Love them. Just beautiful Lisa! 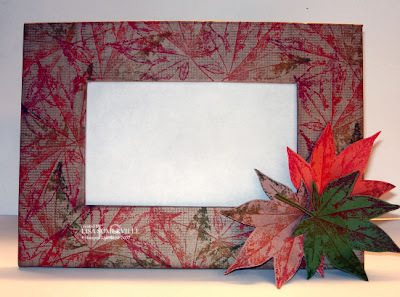 I especially love the card where you stamped the leaves on top of the canvas background. It has great texture! That is just lovely, lisa. Makes me wish for frolicking in the leaves! Absolutely fantastic! We've had a stretch of cooler-than-normal weather here in Maine and I've already seen some leaves starting to turn. I love fall!